Sun sensor measures sun angle to satellite. Our sun sensor is the lightest, smallest and most energy efficient sensor on the market. 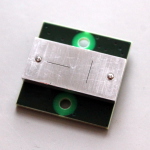 Sensor provides at least ±0.5 degree precision in whole field of view. Our sun sensor has ±45 degrees field of view in two axis, using six sensors it is possible to track sun movement around whole satellite. Sensor is fully self-contained and does not expose any sensitive analog signals for simplicity and reliability. It uses standard SPI interface for communication.